The clergy is a highly overrated institution. Indeed, reports on the value and necessity of clergy have been greatly exaggerated. Many Christians assume, for example, that the most important thing in choosing a church is its minister, that a church cannot function effectively without a priest or pastor, that the first thing one must do in starting a church is to hire a minister to lead it, that Sunday morning should be judged by its sermon, and that the preeminent way to serve God is to go to seminary to be trained for Christian service. But could it be that, on the contrary, clergy are neither necessary nor, in the long run, good for church? Is it possible that one of the best things that could happen to the church today is for all clergy to resign their posts and take jobs in the world? Might it be that church without clergy could be the best kind of church? Certainly, for many we may as well ask whether we should shoot ourselves in the head. But upon closer inspection this perspective is not as lunatic as it first seems. The fact is, although our clergy-system is one of the dominant features of the church today, it has almost nothing to do with the New Testament, is fundamentally counter-productive, and is an inherent obstruction to healthy, biblical church life. PLEASE NOTICE, FIRST of all, that when we talk about clergy we are most definitely not talking about the actual people who are clergy. The specific men and women who are priests, ministers, and pastors are, on the whole, wonderful people. They love God, want to serve God, and want to serve the people of God. They typically are sincere, compassionate, intelligent, self-giving, and long-suffering. Let it be clear, then, that the problem with clergy is not the people who are clergy but the profession that those people are a part of. Furthermore, let it be clear that, despite serious problems of their profession, clergy do actually accomplish much good in the church. It’s not that clergy don’t help people significantly. They most certainly do-which is one reason why they are such a dominant feature of church life. But the good the people of the clergy are able to accomplish is despite their profession rather than because of it. Without a doubt, the clergy is a profession and members of the clergy are professionals. Just as lawyers protect and interpret the law and doctors protect and administrate medicine, clergy protect, interpret, and administrate the truth of God. This profession, like any profession, dictates standards of conduct for how its members should dress, speak, and act, both on-duty and off-duty. And, like other professions, it dictates standards of education, preparation, admittance to the profession, procedures for job searches and applications, and retirement. Clearly, Catholic priests and Protestant ministers alike are expected-by their parishioners, friends, hierarchies, denominational authorities, and themselves-to have a distinct kind of training, be certain kinds of people, and perform certain kinds of duties. Traditionally, the profession has demanded that clergy be male and, in some denominations, preferably married and, if so, happily married. The profession demands that its members possess a seminary degree and official ordination. The profession (unrealistically) requires that clergy be extraordinarily gifted: natural leaders, skilled orators, capable administrators, compassionate counselors, wise decision-makers, dispassionate conflict-resolvers, and astute theologians. Naturally, professional standards insist that clergy be morally upright and exemplary in every way. And, as an outward sign, clergy must dress respectably and speak with authority and conviction. Clergy function essentially as professional church managers. Clergy are responsible for preparing teachings, homilies, and sermons, visiting the sick, conducting funerals and marriages, properly administering the sacraments, overseeing church social events, Sunday School, and catechism programs, preparing engaged couples for marriage, counseling those with problems, preparing denominational reports, attending denominational meetings, managing missionary and evangelistic programs, assembling and overseeing staff (such as assistant ministers, youth group leaders, administrative staffs, and evangelism teams), organizing fund-raising drives, attending to community relations, facilities use, and building maintenance, encouraging, disciplining, and edifying parishioners, and establishing the vision and direction of the church. There exists, then, a definite set of tasks which everyone (even the non-Christian) knows is the rightful duty of a member of the clergy. Everyone knows it because it is an institutionalized profession, created and maintained by denominations, hierarchies, theological seminaries, the laity, and, finally, the clergy themselves. THE FIRST PROBLEM with the clergy is that God doesn’t intend such a profession to exist. There is simply and unequivocally no biblical mandate or justification for the profession of clergy as we know it. In fact, the New Testament points to a very different way of doing church and pastoral ministry. Nevertheless, human societies throughout history have consistently created spiritual castes of people-shamans, priests, soothsayers, witch-doctors, wise-men, prophets, gurus-and the Christian church has been no exception. It didn’t take long for the church to construct, based on a handful of ambiguous scripture verses (“upon this rock I will build my church,” “you shall not muzzle an ox while it is threshing”), a massive, institutional, hierarchical superstructure. This, in effect, created a two-class, authoritarian system within the church in which clergy were considered more spiritual than laity. Protestants broke with the Catholic church, of course. But Protestants are just as “catholic” as Roman Catholics when it comes to clergy. Though the Bible replaced the Sacraments as the center of God’s revelation for Protestants, the profession they set up to protect and distribute this revelation is functionally identical to the Catholic priesthood. As the priest correctly administers the wafer, the minister correctly interprets the Word of God. But when we go back to the Word of God and read it afresh, we see that the clergy profession is the result of our human culture and history and not of God’s will for the church. It is simply impossible to construct a defensible biblical justification for the institution of clergy as we know it. THE SECOND PROBLEM with the clergy profession is that it crushes “body life.” We can see in the New Testament that God doesn’t intend church to be a formal association to which a rank-and-file membership belongs by virtue of paying dues and attending meetings, an association which is organized, guided, and governed by a professional leader (and, in larger organizations, by an administrative bureaucracy). Yet that is exactly what most churches are. By contrast, God intends church to be a community of believers in which each member contributes their special gift, talent, or ability to the whole, so that, through the active participation and contribution of all, the needs of the community are met. In other words, what we ought to see in our churches is “the ministry of the people,” not “the ministry of the professional.” In this way, the church is to act like a body, with each unique, necessary part working for the good of the whole body. And, Paul argues clearly that each member’s gift is indispensable, that the body needs each part to contribute or else it will be lame (1Cor. 12:20-25). The problem is that, regardless of what our theologies tell us about the purpose of clergy, the actual effect of the clergy profession is to make the body of Christ lame. This happens not because clergy intend it (they usually intend the opposite) but because the objective nature of the profession inevitably turns the laity into passive receivers. The role of clergy is essentially the centralization and professionalization of the gifts of the whole body into one person. In this way, the clergy represents Christianity’s capitulation to modern society’s tendency toward specialization; clergy are spiritual specialists, church specialists. Everyone else in the church are merely “ordinary” believers who hold “secular” jobs where they specialize in “non-spiritual” activities such as plumbing, teaching, or marketing. So, in effect, what ought to be accomplished in an ordinary, decentralized, non-professional manner by all church members together is instead accomplished by a single, full-time professional-The Pastor. Since the pastor is paid to be the specialist in church operations and management, it is only logical and natural that the laity begin to assume a passive role in church. Rather than contributing their part to edify the church, they go to church as passive receivers to be edified. Rather than actively spending the time and energy to exercise their gift for the good of the body, they sit back and let the pastor run the show. Think about Sunday morning. Parishioners arrive on schedule, sit quietly in pews, and watch and listen to the minister who is up-front, center-stage, whose presence dominates the service. They stand, sit, speak, and sing only when they are directed to by the minister or the program. Yet, in reality, what happens during these two hours on Sunday morning is only a micro-cosmic picture of the whole church reality. If the people of a congregation began to get a vision that the church is not a formal association but a community, that gifts are distributed-apart from ordination-to each person, that everyone must actively participate and contribute for church to work, that no one’s gift is more important than another’s, and that everyone’s participation will ensure a full, healthy church life-in short, a vision of a biblical view of church life-I suspect many would begin to ask themselves: “Then what are we paying our minister for?” And, that would be a reasonable question to ask. Full-time, professional clergy are only needed when church members are not doing their part. On the other hand, when each church member is actively participating and contributing their part for the good of the body, a professional minister is unnecessary. That is a fact that is proven every day in tens of thousands of communities and home churches all around the world. THE THIRD PROBLEM with the clergy profession is that it is fundamentally self-defeating. Its stated purpose is to nurture spiritual maturity in the church-a valuable goal. In actuality, however, it accomplishes the opposite by nurturing a permanent dependence of the laity on the clergy. Clergy become to their congregations like parents whose children never grow up, like therapists whose clients never become healed, like teachers whose students never graduate. The existence of a full-time, professional minister makes it too easy for church members not to take responsibility for the on-going life of the church. And why should they? That’s the job of the pastor (so the thinking goes). But the result is that the laity remain in a state of passive dependence. Imagine, however, a church whose pastor resigned and that could not find a replacement. Ideally, eventually, the members of that church would have to get off of their pews, come together, and figure out who would teach, who would counsel, who would settle disputes, who would visit the sick, who would lead worship, and so on. With a bit of insight, they would realize that the Bible calls the body as a whole to do these things together, prompting each to consider what gift they have to contribute, what role they could play to build up the body. And with a bit of courage, that church might actually take the painful steps in the direction of long-term change. Some might leave for other churches that have full-time ministers. But those who remained to participate in the work of building body life would mature faster and further than they ever would have with a pastor to do it all for them. THE FOURTH PROBLEM with the clergy profession is what it does to the people in that profession. Being a member of the clergy as we know it is difficult. Doing it very well is almost impossible. Yet good-hearted men and women, convinced that they are serving God in this way, admirably pour their lives into this task. What they encounter as professional clergy, however, is stress, frustration, and burn-out. It’s no wonder, of course, since clergy are trying to do the work of a whole congregation all by themselves! How can a single person be a natural leader, a skilled orator, a visionary, a capable administrator, a compassionate counselor, a wise decision-maker, a dispassionate conflict-resolver, and an astute theologian all at once? Why do we make one person be all things to all parishioners? Being a minister is, quite simply, unrealistic. It is as unrealistic as a corporation expecting a single employee to successfully fill or oversee all of the corporate roles, from mail-boy to secretary to middle-manager to president, while most of the other employees arrive at work one day a week to simply watch this super-human achievement (and sometimes do a chore they are asked by the super-employee to do). In this way, the clergy profession demands super-Christian, super-human accomplishment. Christians-with our realistic understanding of human limitations and weaknesses-should know better than that. God certainly did, which is why he gave the task of maintaining and building up the church as the shared responsibility of all believers, not the centralized, specialized, professionalized task of one person. CLERGY ARE THE keepers-of-the-church; but the church really doesn’t need to be kept in this way because God keeps it and asks all believers to participate in keeping it. The clergy, as a profession, are assigned to preserve, protect, and dispense Christian truth, correct teachings, the Bible, the sacraments, and authority. Yet the Christian truth does not need a professional class to protect it. Truth is not that fragile. Christian truth is not some kind of classified or dangerous material which only card-carrying experts can handle. Nor is it like riches which need the protection of safe vaults and armed security guards. It is the Holy Spirit’s and not the hierarchy or the denomination’s job to preserve Christian truth in history; and the Holy Spirit has seen fit to do so by distributing it to all God’s people so they can share it together. The problem with clergy, we’ve seen, is not the actual people who are of the clergy-who are typically sincere and committed-but the social role of the profession to which they belong. Ministers often hope to re-shape that role in ways that are more realistic and biblical. But they eventually discover that, for the most part, they can’t reshape the role at will because their congregations and denominations expect the standard things from them. Of course, that’s the nature of social roles: they shape people more than people shape them. A problem even more basic and serious than the clergy role, however, is that most Christians have completely redefined what a healthy church looks like in the first place. For most church-goers, a solid, healthy church is one which is growing numerically, has a fabulous pastor, and offers many activities and programs. That may be what a vibrant voluntary association-such as the YMCA-looks like. But if the Bible is our authority, those factors are irrelevant when it comes to church. What’s important in church, according to the Bible, is that each member actively contributes to the good of the whole body through responsible participation and the exercise of their gifts. What’s important in church, according to the Bible, is that believers become strong and mature in their faith through the edification of one another. A biblical church is a “people’s church” with a decentralized ministry. Of course, when we speak of “church without clergy,” we do not mean the elimination of full-time ministers. Indeed, the church needs more full-time ministers. The relevant question, however, is: what kinds of ministries ought these full-time people to be doing? According to the New Testament, full-time ministers ought to be ministering in and to the world, in such tasks as working with the poor, doing evangelism, and making peace where there is conflict and violence. Biblically speaking, it is the world, and not the church, which needs full-time Christian ministers. WHAT WE NEED today is church without clergy. Pastors themselves need to be liberated from the demand to be ultra-versatile, multi-talented, super-human performers. And lay people need to be jarred from the pacifying illusion that it is enough to simply attend church on Sunday mornings and tithe ten percent of their income. Church without clergy is not easy; it demands the full, active participation of everyone. But the rewards of church without clergy-the riches of participation, of solidarity, and of community-make the effort exceedingly worthwhile. And, those who make that effort will be well on their way to transforming church from something they simply go to, to something they, together, are. Clergy – a Biblical Concept? All major faiths have their ‘clergy’ – mullahs, priests, vicars, bishops, elders etc. In Christianity, it would seem that you can’t have religion without them. But are they Biblical? 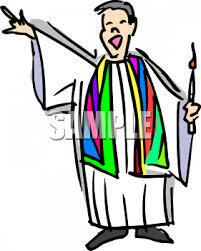 National events are often decorated by a splendid array of clergy in multi-colored attire – each specific to part of the many-layered hierarchy. Perhaps surprisingly all these religious offices – from Pope to Lay Reader – are unknown in the foundation document of Christianity, the New Testament. But such simplicity of structure is alien to most, especially episcopal, denominations. The vast array of church offices has multiplied over the centuries, and much of the dispute within Christianity stems from it. The notion of ‘Christian priesthood’ – clergy – was foreign to the New Testament church. All Christians were ‘brethren’ – the term includes men and women. As sons and daughters of the Almighty (II Corinthians 6:18) we are, before God, all on the same level. The power and pomp of church office obscures that. The apostle Peter addresses the issue. Writing to the church generally he states: “You are God’s heritage”. The Greek word he uses is kleros – from which ‘clergy’ is derived . To the elders he says: “Feed the flock of God which is among you, exercising oversight not by constraint but willingly, not for base gain but readily; neither as being lords over God’s heritage [Gk kleros] but being examples to the flock” (I Peter 5:3). The apostles recognized the need for structure in the assemblies of God’s people. Those men who were gifted by Jesus Christ with his prescribed qualities (eg II Timothy 3, Titus 1) were recognized by the brethren and appointed to shepherd that local flock. No great ceremonial – just a simple public recognition of their spiritual gifts. Their function was to oversee the spiritual growth of all the brethren and to nourish and use the brethren’s spiritual gifts for the benefit of the entire assembly (Ephesians 4: 7-16). It didn’t take long, however, for elders in some assemblies to exalt themselves over the brethren. Trappings of office were added, authority usurped, practices from the pagan religions adopted. Hence the twenty-first century hodge-podge of church offices, hierarchies – and heresies. Inevitably, given human nature, the apostolic pattern for the structure of the church of God was abandoned. Charismatic leaders arose – as foretold by the apostle Paul on a visit to the Ephesian assemblies: “I know that after my departing shall grievous wolves enter in among you, not sparing the flock [tearing it apart]. Also of your own selves shall men arise, speaking perverse things, to draw away disciples after them” (Acts 20:29-30). Hence arose the unbiblical notion of denominations – which replaced the autonomy of each local assembly. The New Testament letters were addressed to these local groups of Christians, instructing them in Christian principles and in how to forward the work Jesus had assigned them. Of course, these principles applied to all God’s assemblies. But it is a misinterpretation to assume that the church of God was one tightly-knit organization, ‘ruled from the top down’, with one man – pope, apostle, evangelist or board – directing every move. Such an approach to church structure encourages the growth of committees, rules, corporate headquarters, inappropriate business practices, unnecessary bureaucracy. It imposes a rigid doctrinal formula – which, accepted, may inflict heresy on an entire denomination. And has often done so. All such absorb the energies of the church and hinder the work of proclaiming the Gospel of God worldwide. To comment on this article or request more information, please contact James McBride by e-mail below. For PDF or mailed copy, see CGOM. Excerpt from New Horizons Issue 37, January/February 2003. Edited by James McBride of the Churches of God, United Kingdom. 2. Does God want Christians to be Free from the Law? 5. “If it’s not in the New Testament…” is it Christianity? 7. Are the Ten Commandments “Religious” or practical instructions from God for daily living? 8. Does God expect Christians to obey the 10 Commandments? Whose Authority? 10. The Law and the Christian How could a good God make a bad law? If the law is good, why has it been done away? If the law is bad, why did Jesus keep any of it? 11. The Law and the Christian part II: The Basics What is law? Why does it exist? Of what does it comprise? Biblical case studies illustrate how law is made, applied and can become outdated. 12. The Law and the Christian part III: Jesus and the Law – Did Jesus abolish, change or clarify the Law? What was the point of contention between Jesus and the Pharisees? 13. The Law and the Christian part IV: The Apostle Paul – What is the purpose of the Commandments? Does justification without the law mean we are now free to disobey the Law? 14. The Law and the Christian part V: Under the Law – Is the Law a curse? Were the 10 Commandments nailed to the Cross? 15. God, grace and graceousness. Is God a god of Justice or of Grace? Does Grace abolish Law? What is Grace? 18. Is obedience to God “Legalism”? Is disobedience “Grace”? … Does It Matter If You “Sin”? 19. Did Jesus Christ come to abolish the Law?… Is God’s Law “Nailed to the Cross”. 20. If Grace abolishes Law, then Which of the Ten Commandments did Jesus Repeal? 21. Has God changed His true religion? Have there been 6,000 Years Of Christianity? 24. Please explain the New Covenant and Old Covenant. 26. The acid test for sound doctrine is: “Does it lead us to become more like God?” Doctrine, then Morality, then Divinity, from “By the Renewing of Your Minds”, Ellen T. Charry, 1997. 27. Does the New Testament have something new to say to you? The New Testament challenges many customary Christian doctrines. 28. Abbreviated Statement of Beliefs. Summarizes in 26 points ABCOG’s theological understandings. 29. Are you absolutely sure that your own position is solid? 30. ABCOG manipulates the Bible to fit your beliefs. 31. How does ABCOG relate to the Seventh-Day Adventists? 32. Will faith always be faith? 33. Shouldn’t you live “apart from the Law”? 34. What New Testament verses “repeal” specific OT laws?